Director Francois Ozon has crafted a gorgeous technicolor love letter to both the films and social movements of the seventies in POTICHE. 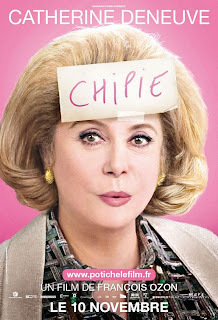 The film's functions mainly as a lighthearted war of the sexes comedy set against the backdrop of sexist attitudes only just beginning to change in late seventies France. There's a bit of class commentary, which seems only fitting in a film trying to recapture the French cinema of this era, but ultimately that seems like just more retro window dressing, little different from the disco soundtrack and brightly colored fashions. Ozon is more concerned with the politics of gender, setting out to show that men on both the left and the right have double standards when it comes to dealing with strong women. When we first meet Suzanne Pujol (Catherine Deneuve), she's walking happily through the woods like a Disney princess, taking delight in the fauna and composing poems. She seems more or less content to be the trophy housewife of umbrella factory owner Robert Pujol (Fabrice Luchini) even though he's an unlikeable philanderer who tells her that her job is to share his opinions, not offer any of her own. That begins to change once Robert gets taken prisoner by striking employees at his factory. Suzanne takes action behind the scenes to elicit the help of communist Mayor/Member of Parliament Maurice Babin (Gerard Depardieu). The two manage to secure Robert's release, but the ordeal has left him in need of hospitalization. In order to keep relations with the workers going smoothly, someone has to step into the role of CEO, and with her children turning down the job, it's up to Suzanne. While nervous at first, Suzanne soon finds she not only likes the job, she's pretty good at it. 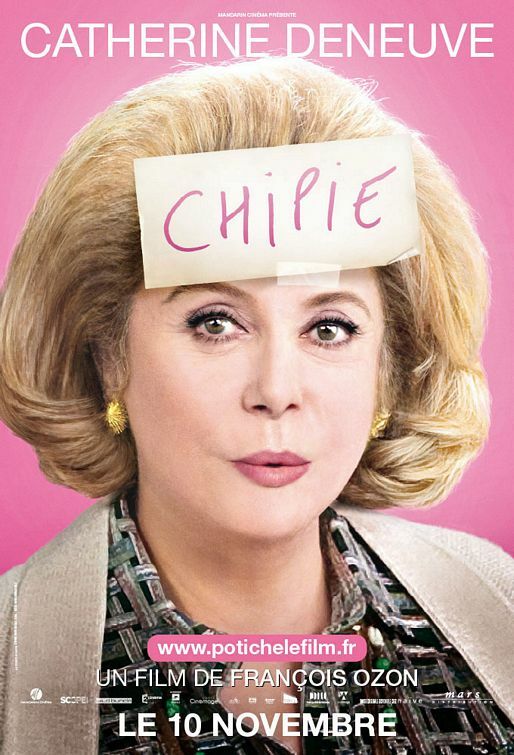 Deneuve is just one of those screen presences you feel compelled to watch regardless, and her Suzanne is a smart, layered character who keeps surprising us right to the end. In contrast, Luchini's Robert is essentially a one dimensional lout, but that's what's called for here. It's up to Depardieu to provide a male character with some depth, and at least a hint of romance. There's also a strong supporting cast, with Karin Viard as Robert's mistress/secretary Nadege, and Judith Godrèche and Jérémie Rénier as the Pujol's grown children Joelle and Laurent. As a comedy, POTICHE is more apt to elicit smiles than full on belly laughs, but its subdued wit is almost always on target. The film concludes with a seeming call to tear down the patriarchy and replace it with a matriarchy that still treats its citizens like children, but in a nicer way, I guess. I'm pretty sure Ozon is being intentionally absurd here, but even if he's completely serious, it at least serves as a catalyst for Deneuve to send us out with a rousing musical number. 3 1/2 out of 4 stars.